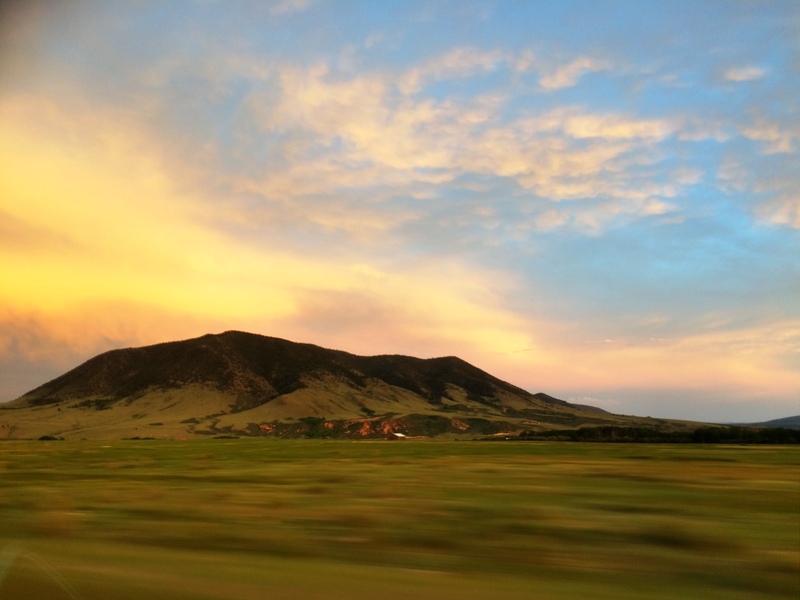 Wyoming is cowboy country. Yeah, we all know that but being here puts an exclamation point on the concept. And speaking of punctuation marks, lifelong friend, Sarah, and I are here for a six-day writing retreat with author Page Lambert and a dozen other people who, in this part of the country, would be called “dudes.” We all came to write but, since you can do that pretty much anywhere, we also came for the horses, knowing they would be a huge distraction. 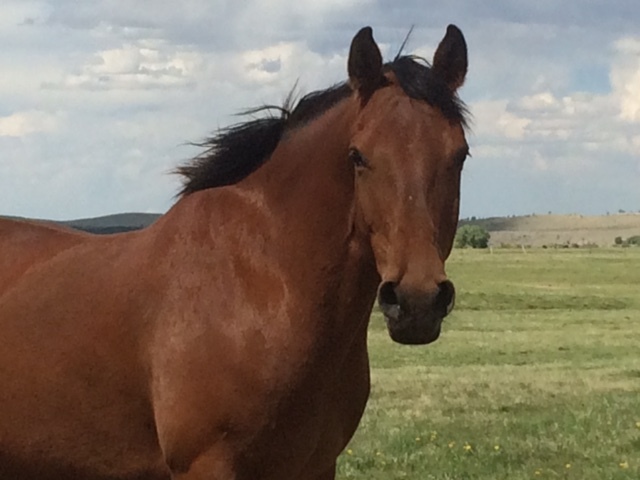 Our retreat is at the wonderful Vee Bar Ranch, 20 miles outside Laramie. The ranch sits along a creek surrounded by cottonwoods and aspen on acres of green lawn. Guest cabins are situated along the creek, and the lodge features a huge granite fireplace and comfy couches. If that sounds like advertising, it gets better. After a yummy lunch on our first day, we eagerly head to the barn to meet our equine partners. My horse, Jimmer, makes a good first impression. He enjoys being touched and, like all the horses here, seems unflappable. 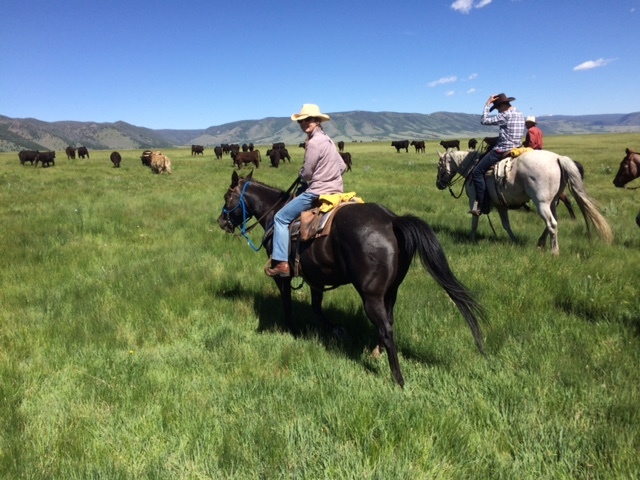 We mount our horses and leave the ranch full of anticipation, then walk-trot-canter across several pastures to a flat-topped hill. As the horses start up the steep, narrow path to the top of the mesa, our horses engage their shoulders and breathe in a rhythm that matches the smoosh of their hooves grabbing bits of loose earth. At the top, the view goes on for forever in every direction. We stop to honor the distances and endless sky. On the way down, Jimmer strays off the rocky path. At first, I want to nudge him back and then remind myself that he knows more about the terrain than I do. And he is creating one of my favorite things — “desire lines,” those less-traveled paths that appear like magic in quiet defiance of roads and groomed trails and sidewalks, a great metaphor for a way of moving in life. Our chief wranglers, Brent and Tommy, tell us stories of crustier cowboys and strident environmentalists and the silly previous guests who had learned to ride English and therefore had some very strange ways of doing things. After we return from our ride, I buy a cowboy hat in the ranch gift store and put my English chaps back in my suitcase. To avoid any misunderstandings. 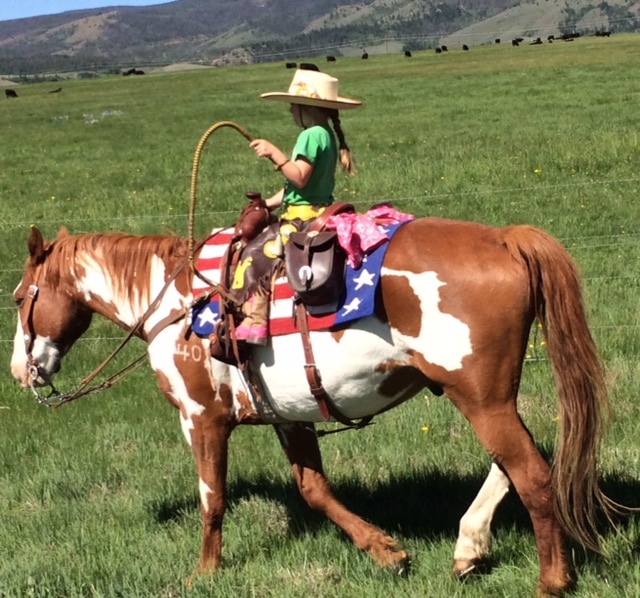 Bailey, daughter of our Vee Bar hosts, who surprises us with her social skills and her equestrian .spirit. 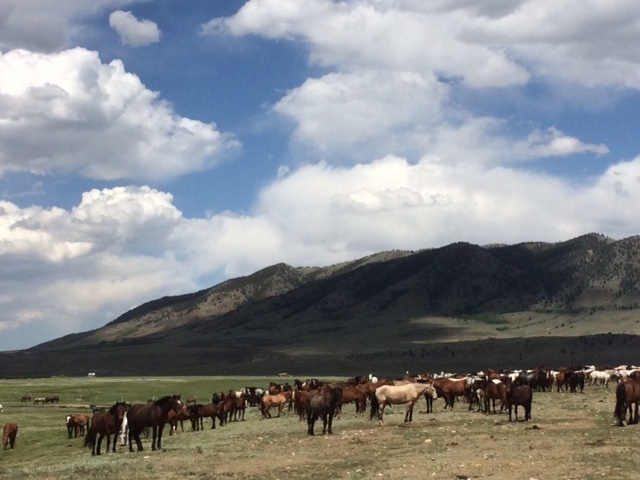 One day after a ride up another mountain, we drive to Deerbrook Wild Horse Sanctuary, where 350 geldings live on 4,700 acres. 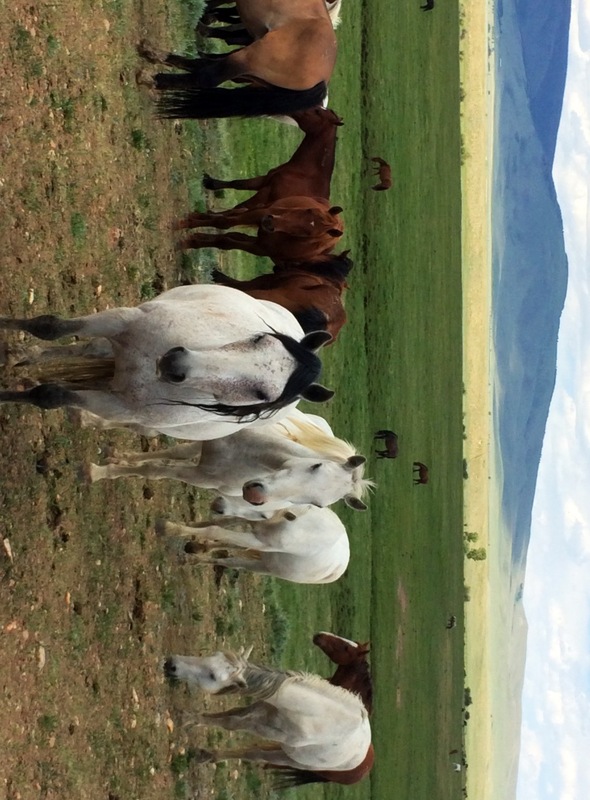 They are mustangs, descended from the horses brought to this part of the world by the Spanish in the 15th century. 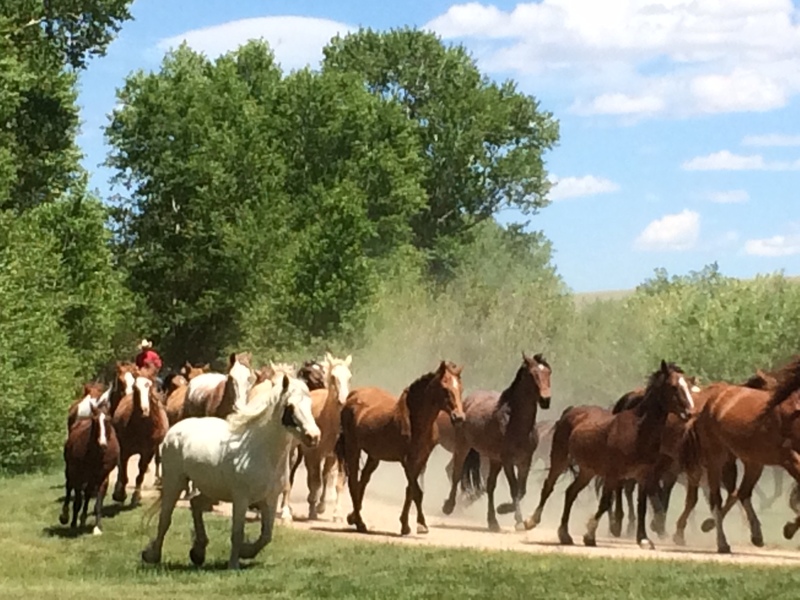 These “wild” horses jog toward us when we arrive at the periphery of their pasture. They sense something in us that feels like trust and love, and they let us know that we are welcome with their gentle curiosity, then continue to the far side of the valley for another day of grazing. Our week of writing (a word so easily confused with”riding”) culminated with a cattle drive, which involved moving 500 head of young steers down the valley to greener pastures. Sixteen of us did the work of one cowboy and a dog so we had four wranglers there to manage us. Adaptability is part of the genius of the modern cowboy. I did get around to some writing…. 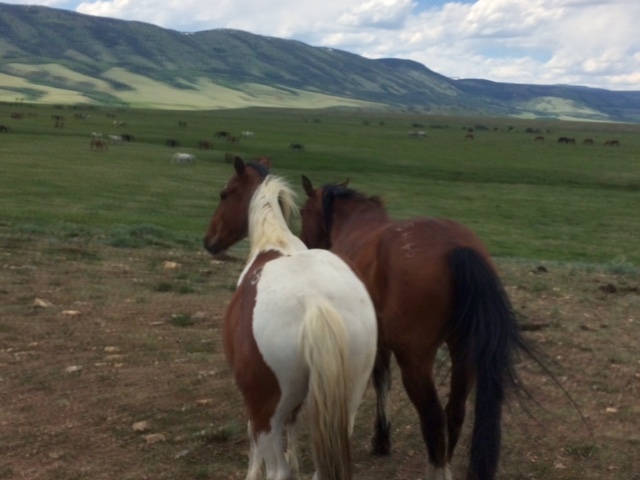 Thanks David, yes, the horses are full of intuition and intelligence and it seems clear that the more they live like horses — in the herd, eating grass, running free, and treated with honor and respect — the more attuned they are. My best gal-pal from elementary school spent a couple of weeks each summer with her family at Vee Bar! Great article; really makes me miss being an equestrian athlete. Small world! I miss being an equestrian too. I am just an occasional rider now!